Most of the time my task of entering bands’ shows into the Hillytown calendar only takes a few minutes, as many of the bands around Portland rarely have more than one or two shows coming up at any given time (obviously we’re talking about the original bands, not the cover bands, who seem to play every night sometimes.) When I do come across a band with a full schedule of local and regional shows, it definitely stands out. 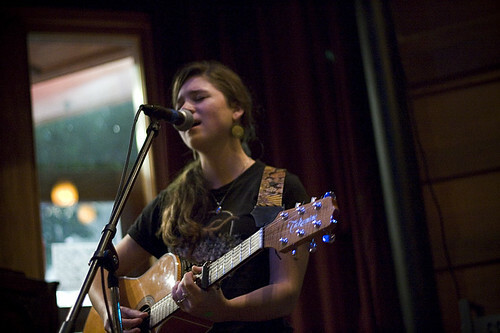 One band in particular that have caught my eye this way is Lady Lamb The Beekeeper. Their Myspace page currently lists 8 upcoming Portland shows (including a Hillytown promoted one) and 5 other shows, all the way from Vermont to Brooklyn! Tonight marks the band’s debut at SPACE Gallery, where they will share the stage with the wonderful Plains and the Swedish group Fredrik. If you have yet to see this fantastic duo of Aly and TJ, come out tonight to see the band before their growing buzz makes local shows rare!